On September 28 - 29, we held the Alpha Workplace Conference (AWC) at SIBKL. Approximately 600 delegates from over 300 companies, 100 churches and nine different countries across the Asia Pacific region came to attend the conference. This year marks the 7th Alpha Workplace Conference, which was held previously in other key cities in Malaysia. The event was designed for Christians in the workplace who want to reach their colleagues with the good news of Jesus Christ, with the aim to train and equip them with the tool of Alpha. We were extremely privileged to have great speakers like Ps Dr Chew Weng Chee (Senior Pastor, SIBKL), Ps Dr Philip Lyn (Senior Pastor, Skyline SIB), David Ong (President & Founder Reapfield Properties) , Richard Low (CEO, Cargill Tropical Palm), Rev Miles Toulmin (Executive Director, Alpha Asia Pacific and Vicar, HTBB), Ps Timothy Loh (Senior Pastor, Every Nation Church Malaysia) and many others, at the conference this year. The event kicked off with a great time of worship led by Worship Central Malaysia. Then, the day continued with a plenary session by Rev Miles Toulmin who shared an inspiring message on "Why Evangelism is Key to the Revitalisation of the Church and Transformation of Society", encouraging delegates that our call to evangelism is part of the call to steward creation. The rest of the two days were filled with various programmes containing a range of topics including The Church and the Workplace: The Way Forward; Raising the Next Generation of Workplace Ministers; Engaging, Influencing and Transforming in the Workplace etc. 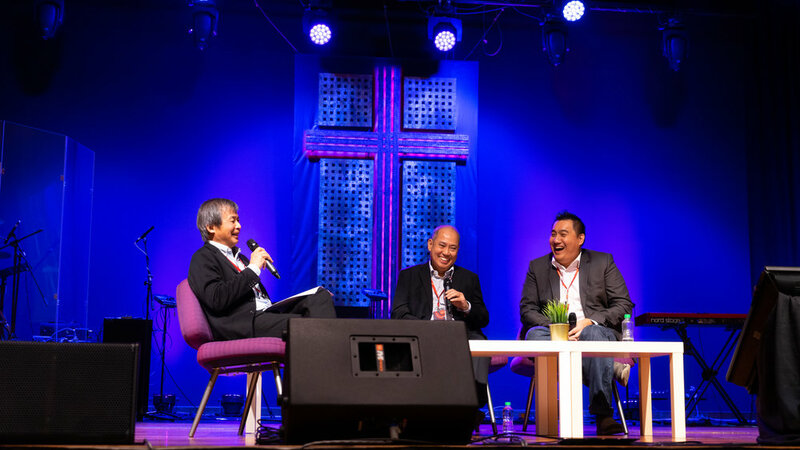 One of the highlights of the conference was the interview session with David Ong and Jef Ong, who shared about their journey in workplace discipleship as mentor and mentee. David made a really impactful statement saying, “The greatest commandment is to love God and to love people. And I really believe that discipleship is really about loving people. It’s not about numbers, it’s about loving people.” It was truly an awe-inspiring moment to hear the two talk about their experiences and how it influenced their faith and work. The conference concluded with a powerful prayer and commissioning session where delegates were given the opportunity to pray for each of the churches and companies represented at the conference, as well as the workplace ministries happening across Malaysia and Asia Pacific. We hope to see more people in the workplace across Malaysia encouraged and empowered to live their lives for Jesus and to share His good news with their co-workers.